We recently celebrated the fourth of July with some friends that had lived a number of years in Israel. Three beautiful prints hang in their dining room, two taken by our hosts and one a professional shot, capturing some of their time in the Middle East. Those photos formed a backdrop for me this past week as we toured a part of the world so often in turmoil, yet home to many people as ordinary as we are. Our initial foray involved a YouTube expedition to the Great Pyramids of Giza. The scope and majesty of the engineering feat was rather lost on the pre-schoolers, but what did capture their attention was the word “Pharaoh.” “Like the one in Egypt, right mom? The King of Egypt?” Apparently Giza was far too pronounced and Egypt too much underplayed. The sun setting behind the pyramids left a mark on Judah however, and the next morning at the breakfast table his suggestion was that we watch that night’s sun set behind the pyramids ourselves. Our week in the Middle East is not that kinda traveling sweet boy! Interest in maps failed this week (they are NOT my children, obviously! ), so rather than post the pathetic scribbles produced to say “Done,” here is the World Map (also found at the Summer Book Club site) I’ve been coloring each week. Colored by region, it’s a way to explore the regions we have visited so far and anticipate the one’s left to come. Additionally, it gives me my own map to color! True confession – I’ve started printing out three maps total so I can color one alongside the kids. How Many Donkeys? 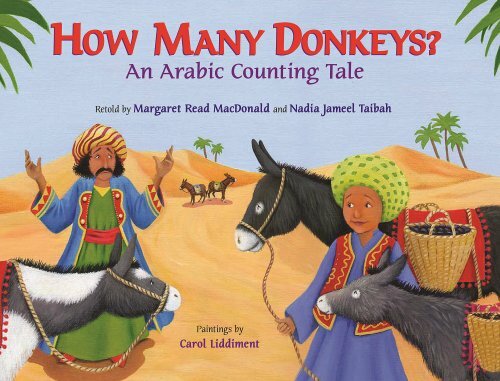 An Arabic Counting Tale retold by Margaret Read MacDonald and Nadia Jameel Taibah is the first book we encountered this week. Jouha owns ten donkeys that he is taking to market, but seems to lose one every other page. Counting the donkeys aloud (in Arabic!) and pointing to each donkey brings to life this “wise fool’s tale” of which variations can be found across the Middle Eastern cultures. Carol Liddiment’s illustrations not only enrich the tale, but are necessary for the “punch line.” We heartily enjoyed How Many Donkeys? 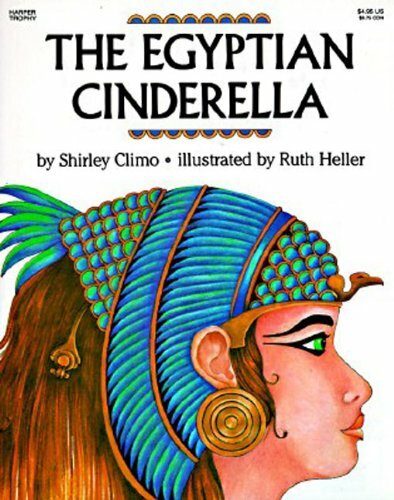 The week’s favorite however, was Shirley Climo’s The Egyptian Cinderella. The immensely colorful and evocative illustrations by Ruth Heller engage a reader immediately, followed by the absorbing plight of a poor slave girl who loves to dance. When her master sees her dancing he buys her a beautiful pair of leather slippers, gilded with “rose-red gold,” and the story follows from there! My littles loved it, we recommend it to you as well. As these weeks fly by, I begin to understand ever more the lure of traveling through reading. Although my soul-spirit longs to visit every country and encounter each culture in it’s birthspot, the reality of that is slim. Nonexistent. Yet as a child I read and learned through fiction and non about people and places my eyes will never see. Perhaps my actual traveling dimmed the glory of that literary adventure, but I can feel the passion re-emerging. We may never be able to take our children around the world in 80 days, but I can introduce them to Phineas Fogg. Here’s to a summer of re-awakening joy – and our next trip through the regions of Asia! Jul 1 Hello World! I'm Reading You Up!